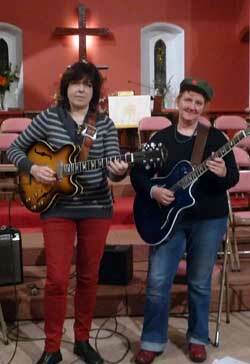 Guitarists Deirdre Cartwright and Kathy Dyson met in 1984 and realised that they were the only two professional women jazz guitarists in the UK; Over 25 years later they?re still the only two. More details to follow… Holborn, may only be for delegates. ?Their interplay (particularly striking on the album?s closer, ?Whirligig?) is a delight throughout a varied and consistently entertaining set.? ?Kathy Dyson and Deirdre Cartwright are both superb players albeit with contrasting styles that, nevertheless, complement each other perfectly. ?All The Things You Are? reminded me of MJQ. The interplay between the guitars could have been created by Milt Jackson & John Lewis ? that?s how good it was. ?